In the morning I helped the older children with their homework, did gardening or other mechanic work and lent a hand wherever it was needed. In the morning time I also created exercises to intensify the children´s skills in language, mathematics and English. Every second week we went to the big market in the south of Quito to buy vegetables and fruits for the foundation´s lunch. After having lunch all together, the children had time to play and frolic around, while we volunteers were looking after them and also playing with them. This was one of the things I enjoyed the most, playing and laughing a lot with the children, enjoying their free time. Once we had finished the face wash and tooth-brushing with the children, we went to the classrooms to help the children with their homework and doing the intensifying exercises prepared in the morning. The kids are divided in two groups, the “small ones” of 5-6 years are downstairs, the “older ones” upstairs. As a volunteer you can choose weekly if you want to work with the small or the older ones. After having finished their homework and additional exercises, there was again time left to play outside in the garden or to play games in the rooms. At 5 p.m. the children got a “refrigerio” (a snack like fruits, cornflakes or chocolate) and at 5:30 they left the foundation. After tidying the rooms and doing the washing up, we volunteers went up to our flat located in the same city district. 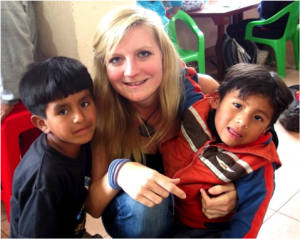 As I always desired to do social work with kids in Latin America, now after having finished my law studies it was the perfect moment to go abroad for some months to work with children in Ecuador. As you work from approximately 9 a.m. till 6 p.m. and live in the same city district, you get a valuable insight to the life of the children and their families in this really poor part of Quito. You learn a lot more about the Ecuadorian way of living than you can learn by only travelling around. Marco, Alba and the whole Minadores de Sueños team, thank you so much for the incredible time full of experiences I had with you. And you kids of Minadores de Sueños – thank you so much, the time with you was wonderful! I will always keep you in my mind!